I was visiting San Francisco for a conference, and outside of conference hours I spent some time exploring the city. The North Beach area is famous for its Italian heritage and modern day Italian restaurants. Mixed in with the pizza and pasta places are a few little pastry shops. One is the famous Stella Pastry & Cafe, which I’ve visited before and is so good that I wanted to return for dessert after a dinner nearby. But alas, for the week that I was in town, Stella’s was closed for renovations! But this being North Beach, fortunately I didn’t have to go far to discover another Italian pastry shop. 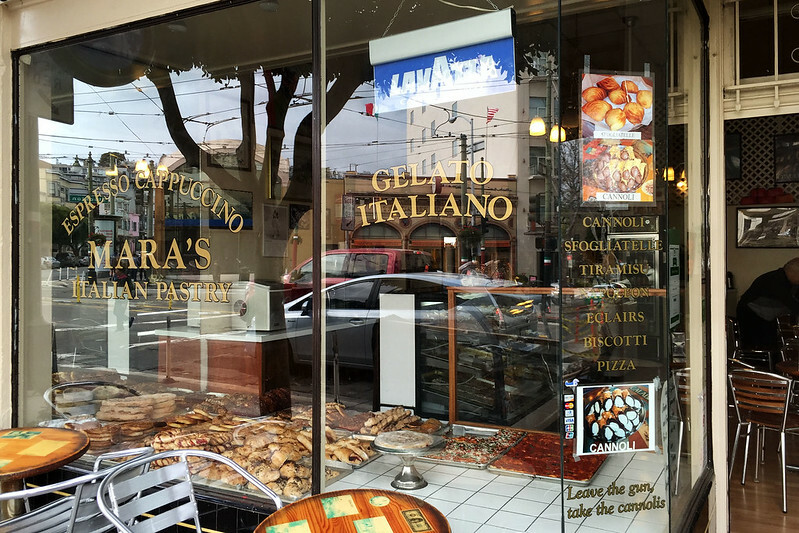 I was walking down Columbus Avenue when my eyes were drawn to the sugar-laden windows of Mara’s Italian Pastry. This hole-in-the-wall was a tiny cafe with only three small tables inside, and a counter loaded up with biscotti and other baked goodies. The real treat was in the front window, however, which contained succulent looking fruit danishes, poppy seed cakes, slices, rolls, and countless other delicacies. There were also a couple of trays of square dish pizzas, cut into slices, for anyone silly enough to come in here and want something savoury. 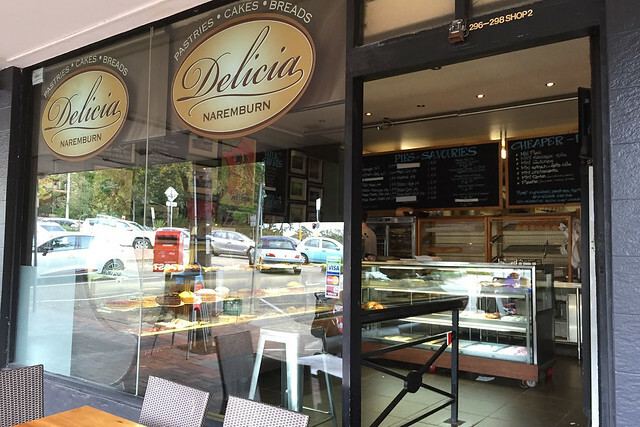 Delitalia is a cafe and Italian delicatessen on the premises of the giant Superfresh greengrocer in Crows Nest. I buy fresh fruit and vegetables here sometimes, and this is also the supplier for the imported Italian pasta that I get for cooking fancy pasta meals. 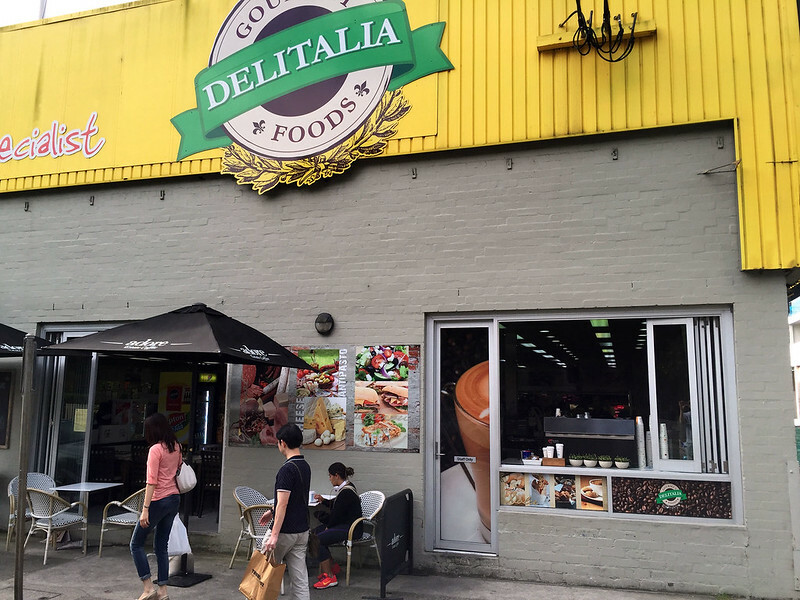 Besides the usual fruit and veges, the deli stocks a wide variety of meats, sausages, cheeses, and Italian groceries, including ready to heat-and-eat items such as arancini and lasagnes. They also have a cake section in the attached cafe, with ricotta cakes, cannoli, biscotti, shortbread, and numerous other delights. 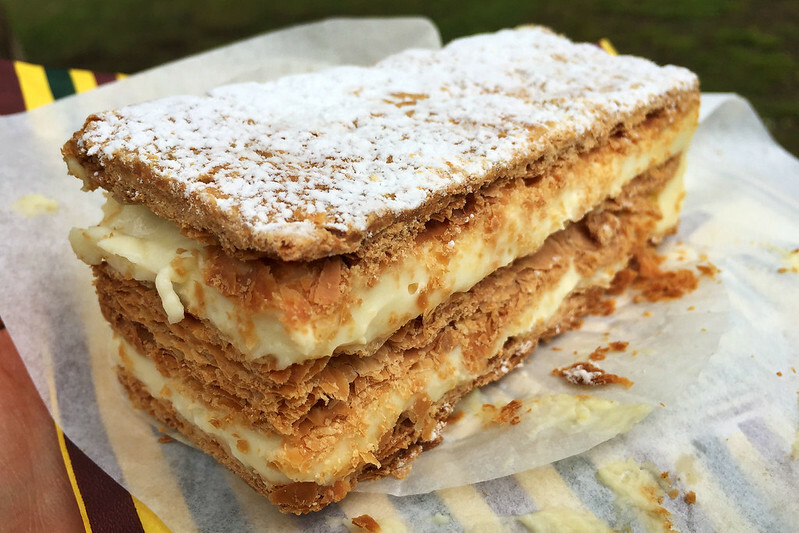 And nestled amongst these is the good old Aussie vanilla slice, but with an Italian twist. 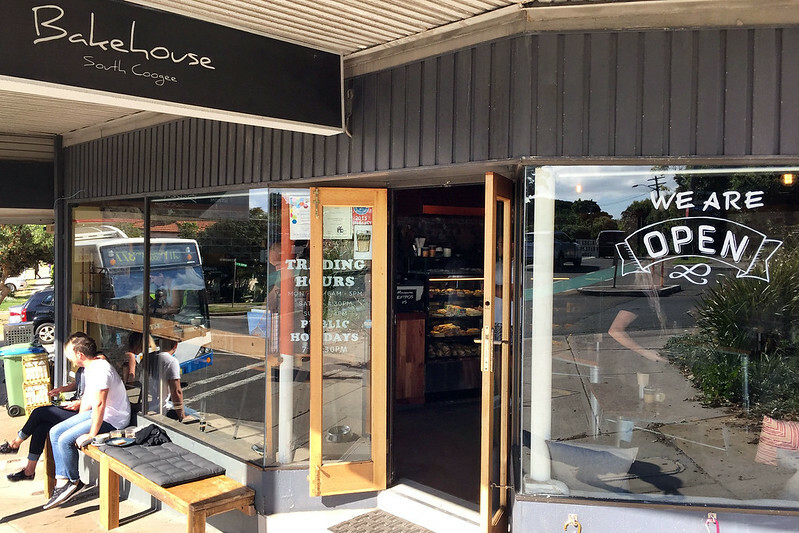 I ordered a slice and sat at the indoor tables – there are also a handful of al fresco tables just outside on the footpath. It’s served on a plate lined with a sheet of paper, with a fork supplied for eating. It’s a very attractive looking slice, with a multifarious layered appearance. From bottom to top, there is a layer of golden brown pastry with plenty of flakiness evident, topped by a layer of dark yellow custard with a slightly moist appearance. This is topped by a second layer of custard, much lighter in colour and more dry looking in texture. Then follows a repeat of these three layers, topped by a third layer of pastry, which is in turn topped by a slab of white icing with the traditional crosswise lines of brown dragged into an alternating zig-zaggy patten by a skewer during the icing process. In a first for Snot Block & Roll, this is a re-review! 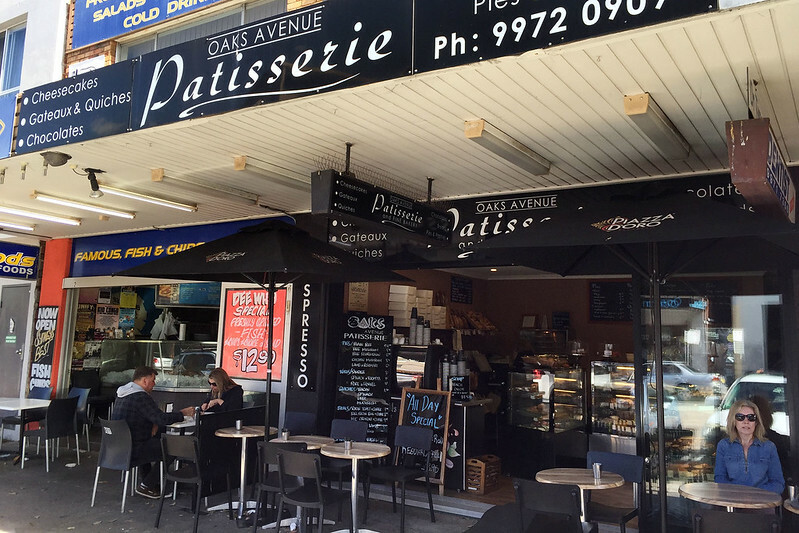 Mr Coker wrote up his original review of The Flaky Tart bakery in Kirribilli some time ago. As the review was very good and the bakery is not too far away, I decided to sample the wares myself. And then I figured why not write up my own conclusions! 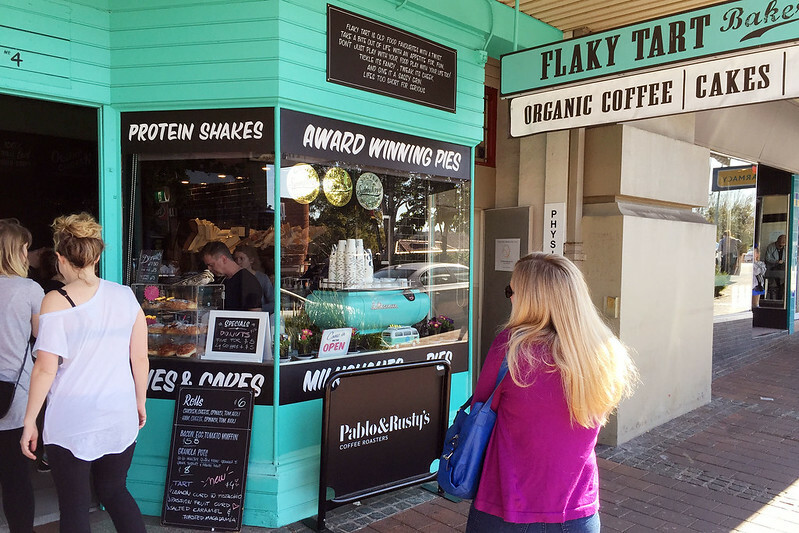 A bit of research reveals that The Flaky Tart is not a one-off shop here under the Harbour Bridge at Kirribilli, but is actually a branch of the better known Flaky Tart bakery of Rose Bay, on the south side of the harbour. Perhaps I’ll have to travel over there one day to sample its wares as well. But on this fine sunny day in Kirribilli, I purchased a sausage roll, vanilla slice, and because I was very hungry, also a chicken and mushroom pie. I found a wooden bench seat nearby, perched on the side of the steeply sloping Ennis Road, overlooking the shops and restaurants of Broughton Street below. As I sat, an inquisitive seagull appeared – perhaps the very same gull that eyed Mr Coker’s samples in the previous review! 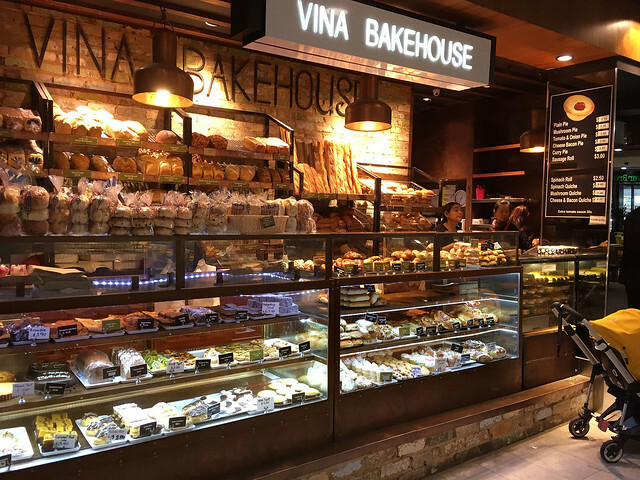 This bakery lives in a food court in the giant Westfield shopping complex in Chatswood, wedged between a cafe and an Asian noodle place. 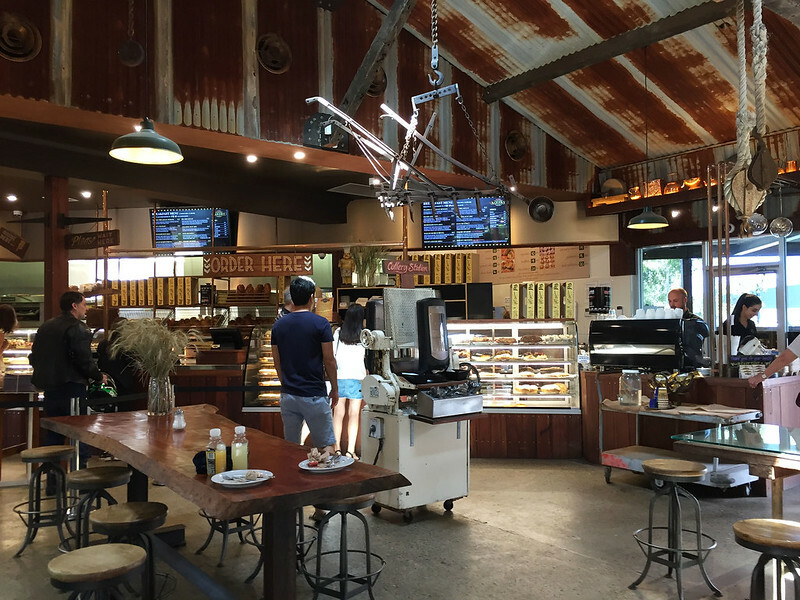 It sells freshly baked bread and a selection of cakes, tarts, and slices, as well as pies and sausage rolls. 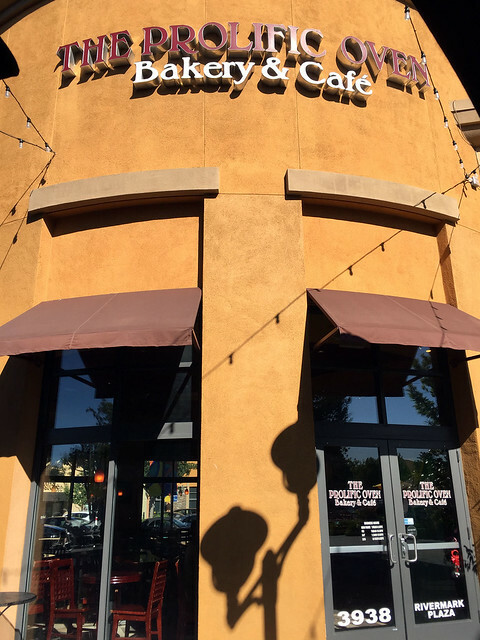 I’ve been here a few times before and don’t have a particularly high opinion of their bread items. I once bought a “bagel” here, only to discover that it was nothing more than a fluffy white bread roll in a very rough and ready approximation of a shape with a hole through it. But being in the area around lunch time, I decided to take the plunge. I procured a sausage roll and a vanilla slice and took a seat at one of the food court tables nearby to examine and taste. An elderly lady and what I presume to be her granddaughter sat at the table with some lunch of their own as well, and the girl looked at me curiously as I photographed and considered my meal. This place looked promising from the outside, with a blend of traditional bakery with just a hint of fanciness in the exterior decoration. Heading inside, there was the odd experience of being served by a swarthy Latino guy in jeans and a white T-shirt and bearing three days’ worth of stubble. He would have looked more suitably placed riding a motorbike to his DJ gig on some Mediterranean island than serving meringues and tarts in a fancy bakery in suburban Sydney. I didn’t see a vanilla slice, so I asked if they made them, and the Ibiza DJ said in a lilting Spanish accent that they had none at the moment, but would be making a batch that afternoon. So I made do with a sausage roll and a chicken pie and went outside to sit at a sunny table in the late autumn chill and perform at least the first half of the reviewing duties.